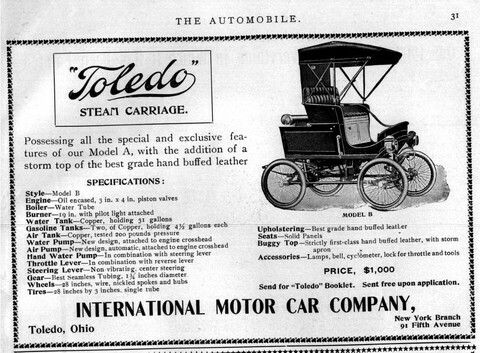 The American Bicycle Company of Toledo, Ohio, part of Colonel Pope's 'empire', began making a light steam car named after its designer Frederick Billings, but by the end of 1901 it had become the Toledo. These vehicles are generally regarded as being better in both design and construction than most of their contemporaries; the engine being a neatly enclosed vertical two-cylinder unit with piston valves, whilst a water-tube boiler that was "a happy combination of the shell and flash type generators" was used. London agents for the Toledo were the Victoria Carriage Works of Long Acre. The car's makers, now called the International Motor Car Company, introduced a 3-cylinder petrol car in 1902 and the following year Toledo steamers were phased out and the petrol cars took the Pope-Toledo name.